‘Last light’, Sue Ford’s latest series, comprises images of everyday photographers with camera raised to the beauty of a fading sunset. Captured in silhouette the photographers Ford depicts become anonymous bodies, entities as pervasive as the sunsets and landscapes before them. Commenting on the ubiquitous nature of digital cameras, Ford appears to suggest that our use of photography has developed into some kind of obligatory performance. One through which we commune with and attempt to possess the transient, ever-changing world around us. The photographers in Ford’s series hold their digital cameras aloft, extending an offering, awaiting a blessing - a photographic ‘puja’ for all. 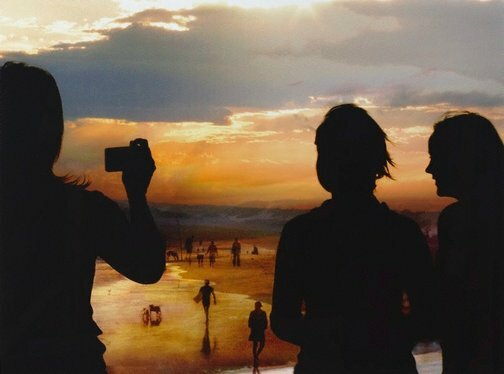 In creating the ‘Last light’ series Ford digitally photographed a variety of coastal scenes at dusk and images of camera-toting photographers separately. She then digitally manipulated and layered these into a single image. Whilst Ford echoes the actions of these photographers in the creation of her series, her final composite images reverberate on a much larger scale. Layered with multiple beach scenes in which a variety of tiny ghostly figures can be seen traversing the shorelines, framed by the anonymous yet omnipresent photographer, a work such as ‘Shadow play’ encompasses an eternal and repeating cycle of visitation and visualization. Ford aptly presents these ideas and experiences surrounded by the universal markers of time – the shifting sands, setting sun, and the changing tides. Experiences both individual and collective like time itself. Signed and dated c.r. verso, black fibre-tipped pen "Sue Ford... '07". SUE FORD: LAST LIGHT , 2007.